The first two items item I made from the bounty in Grandma's garden were old favorite soups. One was Butternut Squash Soup. I made it the same way I've made it before, and it was a hit -- so much so that I didn't get a chance to take a picture! As before, the cinnamon croutons were a tasty touch. 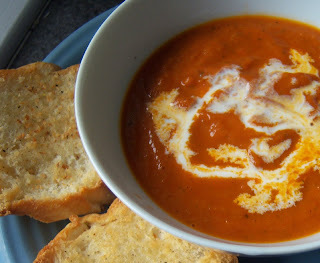 The other was Roasted Tomato Soup. I wrote about it a couple of years ago, in this post, when I wasn't geeky enough to be taking pictures of food. This time, I made a few changes to the recipe. I garnished the soup with just a little heavy cream, which was reminiscent of a trip Grandma and I (along with my Mom) took to Ireland -- almost 20 years ago! They made delicious cream soups there, and always garnished it with heavy cream. Somehow mine doesn't look as nice as theirs did, though. I also cut back on the fresh basil (because it's so expensive in the supermarket) and used some dried Italian seasoning. I also added a bit of sugar to bring out the flavor of the tomato. Prepare the tomatoes. In a large bowl, mix the tomatoes, 1/4 cup of the oil, the vinegar, garlic, salt, and pepper. Spread the tomatoes on a nonreactive* baking sheet. Roast the tomatoes in the oven until very dark in spots, 40 to 45 minutes. Remove and allow to cool. Prepare the bruschetta. Cut the bread crosswise into slices about 1-inch thick. Lightly brush the slices on both sides with oil and season with salt. Place the slices on a baking sheet and toast in the oven until the bruschetta are golden brown and just beginning to crisp, about 7 minutes. In a large saucepan over medium heat, combine remaining 2 tablespoons oil, the onions, and a pinch of salt. Cook until the onions are very soft, 8 to 10 minutes, stirring occasionally. Add the 2 cups basil leaves and saute with the onions for about 1 minute. Add the roasted tomatoes, water, dried Italian seasoning, and sugar to the saucepan. Bring the mixture to a simmer and cook for 10 minutes. Puree the tomato mixture in a blender (start at slow speed and increase gradually). The mixture should be smooth. Taste and adjust seasonings. You can prepare the soup to this point and refrigerate it. I served the soup garnished with the heavy cream, and with bruschetta on the side for dipping and sopping up every drop of the soup. For the past few days, my wonderfully supportive husband has been holding down the fort at home while I've been in Wisconsin taking care of my 94-year-old Grandma. 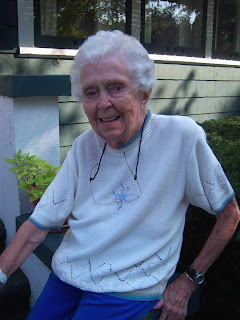 She is sharp as a tack -- has a memory better than mine -- but needs some help with meals and that kind of thing. For the past couple of years, her children and grandchildren have taken turns moving into her house to take care of her. I'm taking a week-long shift and I'm glad to have the chance to spend some "quality time" with her. 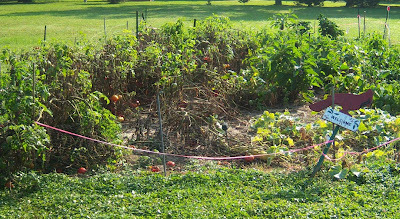 Anyway, Grandma lives in the house that was her parents' house, and as a result of Big Bob's legacy, the property has two large vegetable gardens, as well as raspberry bushes, grape vines, and a large apple tree (all maintained by my Uncle Bob -- fitting huh?). Yesterday Uncle Bob decided that was the day to put the garden to bed. I helped him harvest all the remaining vegetables and then pull out the plants and load all the stuff into his truck for disposal. It was hard work -- I can feel it in my arms and legs! I have a greater appreciation for all of his hard work in that yard. 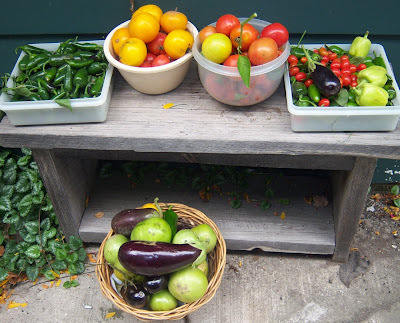 When we were done, there was a bounty of veggies -- this picture is about half of what we harvested. We've pawned off some veggies on a few of Grandma's friends, as well as a friend of mine who visited today. But there's a long way to go, and I don't want to see all of this good stuff wind up in the trash. As a result, I am cooking like crazy to try to use it up. Will be back with some of the results of my efforts within the next day or so. I'm a sucker for those bookstores that sell books at 70% off, and once inside my biggest weakness is the cookbook aisle. My younger son has the same tendencies, and he recently purchased a couple of books that supposedly copy famous brand-name recipes. 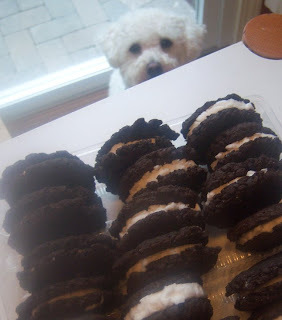 The first recipe that he was after me to try was supposedly a copy of Oreo cookies. Personally, if I want Oreos (which I rarely do), I'll buy them. But I gave in. We just didn't have the patience to make them as tiny as the recipe called for. I'm sure that's why the cookies were chewy instead of crunchy. 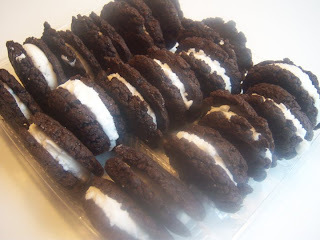 They were also sweeter than Oreos, which may have been the result of me not being able to find the brand of cake mix the recipe called for. The filling, however, was just like real Oreos. I don't think they'd make these again, but my son enjoyed the process and that's what counts. Mix together the cookie ingredients with an electric mixture, then knead with your hands until it's a smooth dough. Form the dough into balls about 3/4 inch in diameter (this is pretty tiny and we didn't get them that small) and press flat (we used the back of a measuring cup). Place 1/2 inch apart on greased cookie sheets. Bake for 6-8 minutes (ours took longer), or until the cookies are crunchy (ours never got crunchy). Let the cookies cool on the sheets. While the cookies cool, mix together the filling ingredients with an electric mixture. Form the filling into balls about 1/2 to 3/4 inches in diameter. Place a filling ball in the center of the flat side of a cooled cookie. Press with another cookie, flat side down, until the filling spreads to the edge. This recipe supposedly makes 60 cookies, but we got about 20. 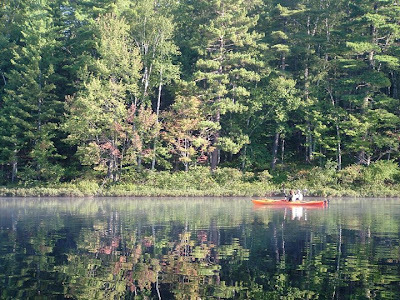 Over Labor Day weekend, our family joined another family for a camping trip in the Adirondack mountains. We went to a state campground called Rollins Pond. I never sleep well while we're camping, so one day I decided to get up and watch the sun rise over the pond. 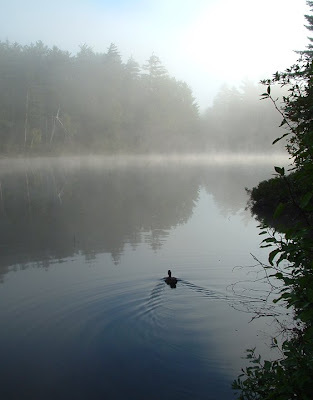 At first it was completely quiet and the mist over the pond made it hard to see to the other side. Eventually a kayaker emerged from the mist. I also spotted a loon but he was too quick for my camera. 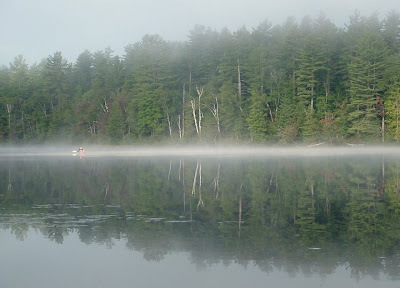 More kayakers lazily floated by as the mist dissipated and the pond became like a mirror. It was a nice way to start the day. 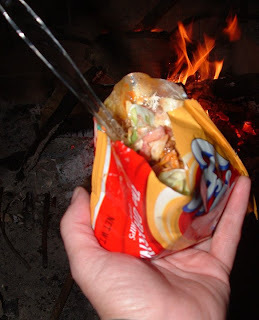 I'm not a fancy cook when we camp, but I did try a new "recipe" that was a hit with kids and adults alike. My friend, Marie, gave me the idea from something she had eaten at a street fair, called Walk-Around Tacos. You crush a single-serving size bag of Fritos or Doritos, then cut open the side. Insert your favorite taco toppings -- taco meat, cheese, lettuce, tomatoes, etc. Eat the whole thing right out of the bag with a fork. The nice thing about this for camping was the fact that you only had to cook the taco meat, and the only dish was the pan used for making the taco meat! A definite keeper recipe for camping!